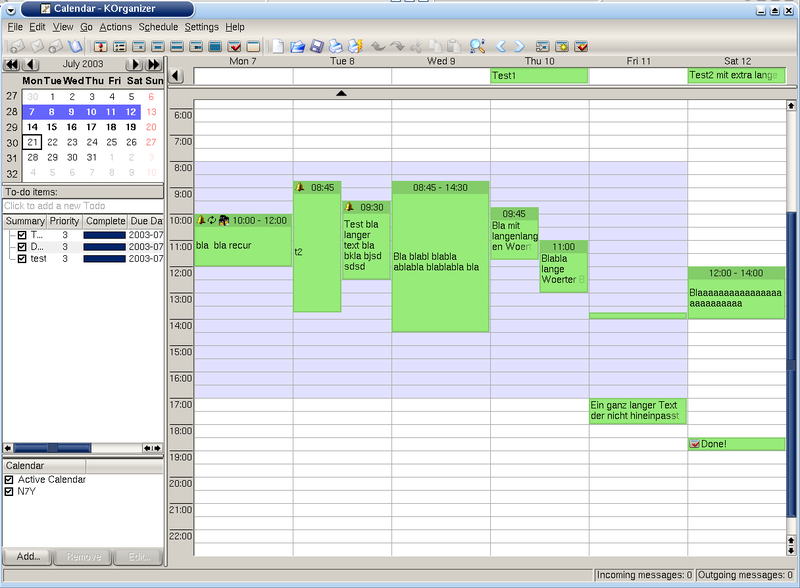 Tim Jansen has committed the new look for KOrganizer's agenda view (Screenshot). This is a big improvement. People were complaining from time to time about the "boring" look of KOrganizer. Now they don't have a reason for that anymore (Well, I'm sure somebody will come up with another reason to complain ;-). I've surely had my part in the complaints about that old look&feel of korganizer calendar.. and i'm still not entirely convinced this version is here to stay, but it's the biggest improvement in a long time to korganizer if you ask me :) it will be more attractive to use it. Yes, this certainly makes Korganizer a little bit more handsome. Good job! Does it support different colors for different categories (job, private, family, ...)? Sure, KOrganizer supports that for ages.